This 3/4" thick, tempered-glass vessel is circular with a slightly flared-shape bowl, rich in gold and bronze crackled-foil whose texture can be felt on the golden matte exterior. Its non-porous surface is extremely attractive and sanitary - naturally resistant to stains, odors, discoloration, and heat damage. With an overall measurement of 17 3/4" x 17 3/4" x 5 3/8", it will require a minimum-width cabinet of 18". 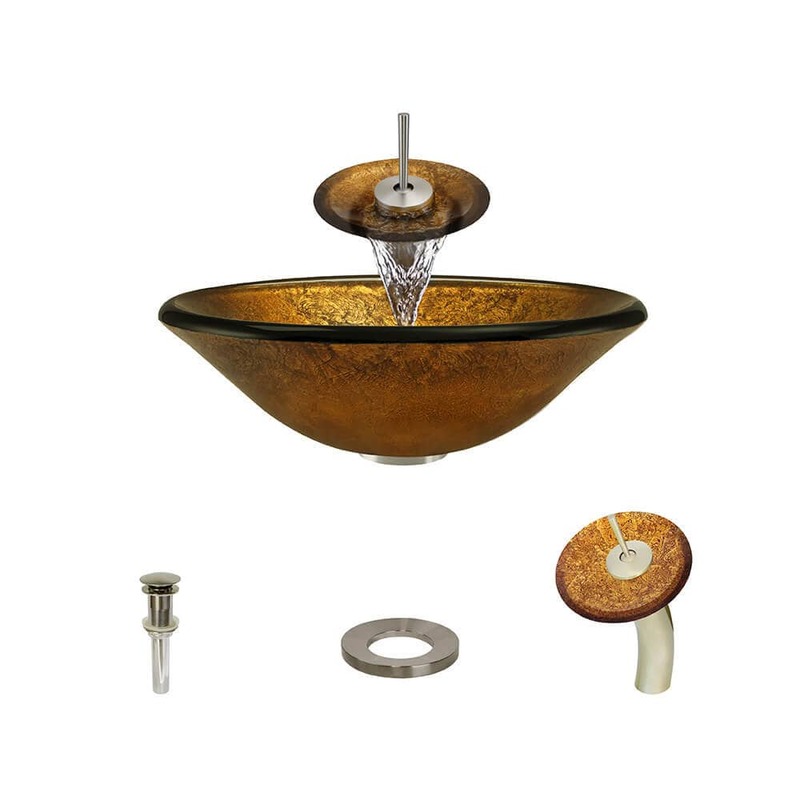 The waterfall faucet features fully-tested, superior-quality, solid-brass components. The matching disc which circles the spout is made of the same material as the basin below. While several MR Direct vessel-style faucets may nicely complement this bowl, the waterfall design is simply stunning. This tall metal fixture gracefully bends over the basin with a slender, joystick-style toggle at the top for control of water flow and temperature. Around the neck of the shaft is a seven-inch diameter disc over which water cascades from the tall spout and into the distinctive basin. The shaft features an attractive brushed nickel finish. The included sink ring stabilizes the curved bowl above the counter and coordinates with the brushed nickel finish of the other fixture's. Additionally, a spring-loaded, vessel pop-up drain (vpud) is included, which opens and closes with a simple press to its attractive brushed nickel cap.